Representative Honours: Ireland: 11 Full Caps/4 Goals (1931-1936); Irish Free State: 4 Full Caps/2 Goals (1932-1936); Irish League: 16 Caps/6 Goals (1931-1948); Northern Regional League: 2 Caps (1943-1944); League of Ireland: 2 Caps/1 Goal (1947); FAI Representative: 1 Appearance (1936). Club Honours: (with Derry City) Irish Cup Winner 1948/49, Runner-Up 1935/36; City Cup Winner; North-West Senior Cup Winner; (with Dundalk) League of Ireland Shield Runner-Up 1946/47. Dual international winger Jimmy Kelly was one of the most prolific players in the history of the Irish League, and reputedly the possessor of the most powerful left-foot ever! He had begun his senior career with Coleraine (his long list of clubs as a youth included Stranorlar School, Long Tower Boys School, Foyle Stars, St. Columb's Court, Newry Town and Fulton Rovers) before being snapped up by Liverpool in May 1928. Unable to make the breakthrough at Anfield, he returned to Ireland disillusioned, signing with Derry City in October 1930 for £100. Liverpool weren't to let let go that easy and stipulated that they would receive half the fee if he ever signed for another English club. Immediately on his return to Ireland, Kelly began to set the Irish League alight, finding the back of the net with unerring regularity over a twenty year period. 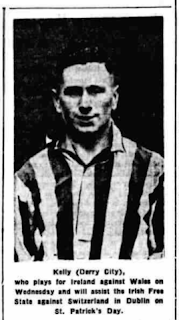 His total goal-tally for Derry is believed to be 363, and included a goal in Derry’s 2-1 Irish Cup Final replay defeat by Linfield in 1936 - the club's first major final. He was fast, skilful, courageous, exciting, and of course, that left-foot meant he was deadly in front of goal. Selected for the Irish League for the first time against the Scottish League in October 1931, he scored twice to inspire a rare victory, 3-2. For the Irish League he also scored the deciding goal in a 2-1 victory over the Football League in September 1935, and the following year a hattick against the same opposition brought a 3-2 victory. October 1931 also saw Kelly awarded his international debut, and he marked the occasion with a goal in a 6-2 defeat by Scotland. The following season he scored twice in a 4-0 victory over Wales, in what proved to be one of only two victories of his Ireland career. Also capped by the Irish Free State, he put in a “brilliant display” on his debut, a 2-0 win over the Netherlands in Amsterdam. In February 1934 he provided two of Paddy Moore's four goals as the southerners battled from 2-0 then 3-1 down to draw 4-4 with Belgium. Having scored 32 goals for Derry in the 1935/36 season, Kelly was recalled to the Free State squad for their tour of Europe in May 1936. He appeared against a Rhineland XI and won his final cap, scoring his only two Free State goals, in a 5-1 defeat of Luxembourg. During the Second World War, Kelly turned out for Shamrock Rovers, where he scored six League goals, including in a 1-0 win on his debut against St James's Gate on 22nd February 1942. In 1946 he signed for Dundalk where he made a big impression, he scored 17 times as a "poor" Dundalk side finished as League of Ireland Shield runners-up. So impressed were the Oriel Park fans that they voted Kelly into a "Best Ever Dundalk XI" during the mid-1950s, despite his single season stay at the veteran stage of his career! For all his talent, one incident highlights that Kelly may not have taken his football completely seriously. In a January 1947 League game for Dundalk against Shelbourne, he left the field with 15 minutes remaining, leaving the team to finish the game with ten players and a 2-6 final score. The explanation offered by the Dundalk Democrat in its match report was “Jimmy was anxious to make the 5 o'clock train back to Derry”! 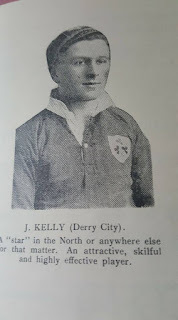 Kelly remained with Derry City through to the early 1950s, helping the club to their first ever Irish Cup success, a 3-1 victory over Glentoran in 1949. He made his final appearance for Derry in January 1951 and after over twenty years of prolific goalscoring, Kelly hung-up his boots in 1952. "Anyone who never saw him play in his prime missed one of the most fascinating sights in football. He was a great player - but even more important, he was a great person." Summary: 11/4. Won 2, Drew 1, Lost 8. Summary: 4/2. Won 3, Drew 1, Lost 0. Summary: 2/1. Won 1, Drew 0, Lost 1.